A Washington Post reporter for nearly 30 years, Morton Mintz investigated corporate misconduct in the tobacco, automotive and pharmaceutical industries. Mintz broke stories about the consequences of using thalidomide and the Dalkon Shield. He is the author and co-author of numerous books, and he is senior adviser and commentator for the Nieman Watchdog website. Morton Mintz recalls reporting on thalidomide, a drug that helped women with nausea during pregnancy, but caused deformities in their unborn children. His reporting revealed that the drug maker had applied pressure to officials of the Food and Drug Administration for quick approval to the lucrative U.S. market. Mintz graduates from the University of Michigan with a bachelor’s degree in economics. Shortly after graduation, he joins the U.S. Navy where he serves for three years. Accepting a job at the St. Louis Star-Times, Mintz works at the newspaper for four years, then goes to the St. Louis Globe-Democrat. At the Globe-Democrat, Mintz reports and writes what is believed to be the nation’s first newspaper series on the plight of the mentally disabled.3 Mintz eventually becomes the assistant city editor. Mintz begins his nearly 30-year career as a reporter for The Washington Post. At the Post, Mintz exposes the dangers of the chemical thalidomide, a sedative that causes several thousand children worldwide to be born without arms or legs. His reporting leads to a Senate subcommittee oversight hearing of the Food and Drug Administration. After that hearing, the FDA does not approve thalidomide for sale in the U.S.
Mintz accepts a Nieman Foundation fellowship at Harvard University. Writing his first book, “The Therapeutic Nightmare,” Mintz reports on the respective roles of the FDA, the American Medical Association and pharmaceutical manufacturers. Mintz begins reporting on the tobacco industry, covering the beat throughout most of his career. He also covers the Supreme Court for the Post. Mintz breaks the story about General Motors’ surveillance of Ralph Nader, the automaker’s biggest public critic. Nader had written “Unsafe at any Speed,” which in part reported the hazardous record of GM’s Corvair. Mintz’s revelation that GM hired private detectives to follow the consumer advocate becomes a national embarrassment for the corporation and also results in successful civil litigation by Nader against GM. Mintz writes “By Prescription Only,” which further investigates the FDA and the nation’s largest pharmaceutical companies. In his book “The Pill: An Alarming Report,” Mintz reveals that when the FDA approved the birth control pill in 1960, the agency authorized an uncontrolled medical experiment. The pill’s safety was based on inadequate scientific evidence, yet millions of women would take the contraceptive regularly throughout their childbearing years. Investigating the extensive influence of corporations in the U.S. government, Mintz co-authors “America, Inc.: Who Owns and Operates the United States” with Jerry S. Cohen. As an expert on corporate power, Mintz is a contributing writer to “In the Name of Profit: Profiles in Corporate Irresponsibility” by Robert L. Heilbroner. Mintz returns to The Washington Post’s Supreme Court beat for the next two years. 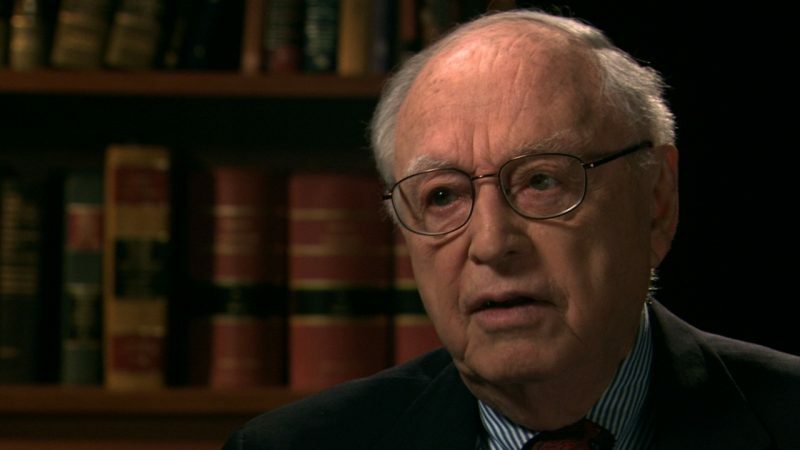 In an exclusive interview with Assistant Secretary of War John J. McCloy , who had served in the Roosevelt administration, Mintz reports on the refusal of the United States during World War II to bomb the rail lines transporting Holocaust victims to the Birkenau or the Auschwitz prison camps. Mintz writes “At Any Cost: Corporate Greed, Women, and the Dalkon Shield,” exposing the manufacture and distribution of the Dalkon Shield , an intrauterine contraceptive device that ultimately makes millions of women vulnerable to serious infection, sterility and even death. Having investigated the major tobacco companies since 1965, Mintz covers the landmark trial, Cipollone v. Liggett Group Inc. , in which a federal jury finds the cigarette manufacturer liable in the 1984 lung-cancer death of Rose Cipollone. Cigarette makers disclose for the first time what they knew of the dangers of smoking. Mintz retires from the Post. Mintz becomes chair of the Fund for Investigative Journalism , a position he holds for three years. In his report “Allies: The ACLU and the Tobacco Industry” for the Advocacy Institute, Mintz exposes the American Civil Liberties Union’s failure to inform its members that it accepted money from the tobacco industry and advocated for it in Congress. Mintz takes on the role of senior adviser for the newly created Nieman Foundation Watchdog Project. Mintz writes media criticism for Tompaine.com , an early online opinion journal, in a series called “Mort Wants to Know.” In the 28-part series, Mintz poses questions that press is not asking of presidential and congressional candidates in the 2000 campaign. Mintz writes “Two Minutes to Launch” for the American Prospect, which explains the U.S. missile defense program and its “hair-trigger” alert status. Providing commentary for the Nieman Watchdog blog , Mintz becomes a national media critic. Criticizing news pundits , Mintz says there should be a standard for news organizations to hold their talk show hosts and editorial writers accountable to journalism ethics and norm. As senior adviser, Mintz continues to criticize mainstream media for the Nieman Watchdog Project, including a commentary on whether the media should hold corporate executives accountable for the negative effects of their products. “The Therapeutic Nightmare.” Boston: Houghton Mifflin Co., 1965. “By Prescription Only.” Boston: Beacon, 1967. “The Pill: An Alarming Report.” New York: Fawcett, 1969. “America, Inc.: Who Owns and Operates the United States” (with Jerry S. Cohen). New York: Dial, 1971. “Power, Inc.: Public and Private Rulers and How to Make Them Accountable” (with Jerry S. Cohen). New York: Viking, 1976. “At Any Cost: Corporate Greed, Women, and the Dalkon Shield.” New York: Pantheon, 1985. “Quotations from President Ron” (with Margaret Mintz). New York: St. Martin’s, 1987. Interview with Charles Lewis on April 26, 2007 in Washington, D.C.